I love tortes. LOVE them. I've had some sour cream sitting in the fridge, and I wanted to put it to good use. So when I went home last weekend, I exploited my mother's credit card to purchase frozen blueberries [hey, frozen fruit is expensive!] 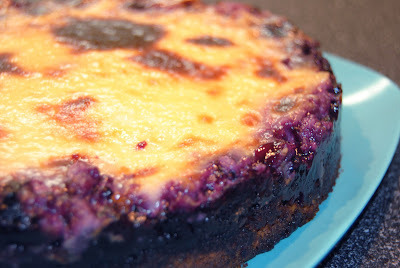 to make this torte. I figured today was as good as any to go ahead and bake it; it's been one of those super lazy Saturdays, staying in [aside from my Farmer's Market run with Rudhdi this morning and getting caught up in game-day traffic], napping [or failing to do so], feeling like crap [something's going around campus these days, ugh]. Okay, so mainly I wanted to bake something to lift my spirits a bit. But hey, it worked. Plus, it was a lovely way to end our dinner of chicken jalfrezi earlier. 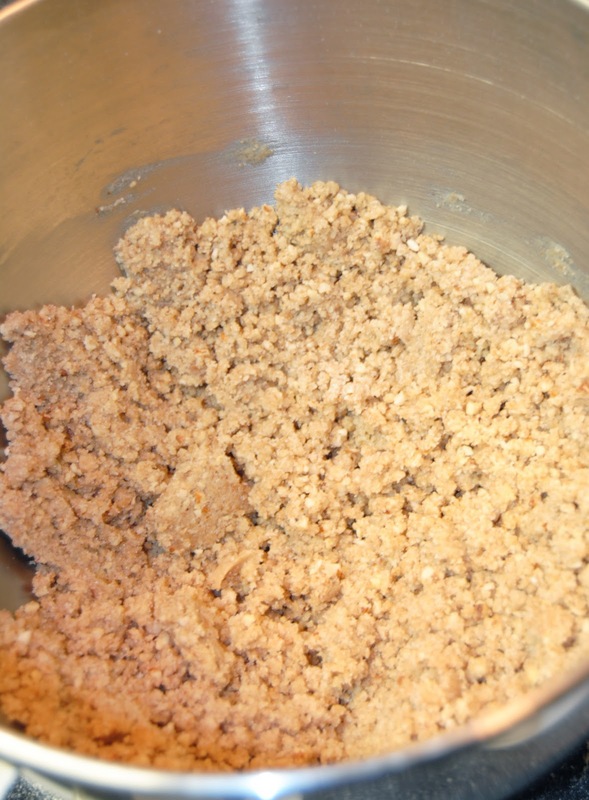 Now, tortes are dense cakes made with ground nuts in place of the majority of flour used. They're fantastic because they lower the glycemic index of usually very high-GI desserts [ignore the cups of sugar that go into them...], but also because they have very nutty, crispy, rich crusts. And everyone knows crust is the best part of any dessert. 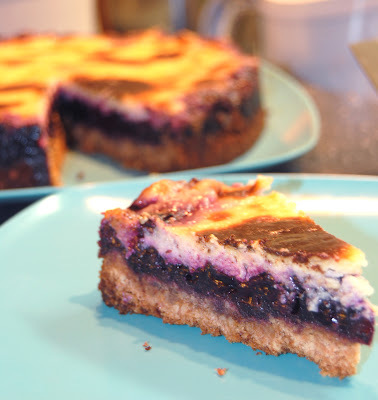 Though, when said dessert has a filling made of 4 cups of blueberries and a creamy, tart, topping made of sour cream, it's a pretty close call. Preheat oven to 400 degrees Fahrenheit. Grease a 9-inch springform pan and line the bottom with parchment paper. For crust: combine flour, almond meal, ground almonds, sugar, baking powder, and salt in the bowl of an electric mixer with the paddle attachment on medium-low speed. Add in butter and increase speed to medium. Combine until dough becomes crumbly and starts to come together. Pour crust into the prepared pan and press evenly over the bottom. Bake for 10-15 minutes, until crust is golden. Remove from oven and let cool. Reduce oven temperature to 350 degrees as the rest of the torte is assembled. For filling: in a medium saucepan, combine all filling ingredients. 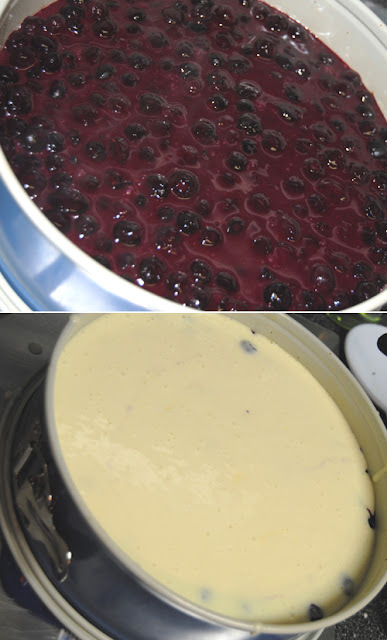 Cook over a medium flame for 3-5 minutes, stirring gently, until blueberries start to bubble and burst. Reduce heat to low and simmer for 3 minutes. Set aside to cool slightly. For topping: In a medium bowl, combine all topping ingredients. Mix until well blended. Pour filling on top of crust and spread evenly. Pour topping on top of filling and smooth gently with a rubber spatula, without mixing the topping into the filling itself. 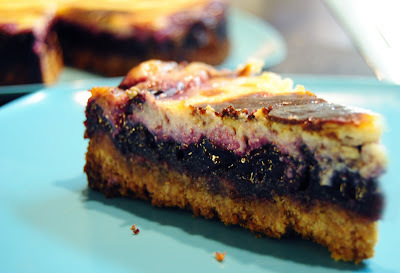 Bake torte for 45 minutes. Set torte on a wire rack and let cool completely before unsnapping the sides and removing the torte from the pan. Refrigerate until ready to serve. To be completely honest, I was terrified that this was going to fall apart. I thought the cornstarch wouldn't effectively hold the blueberries together and there would be some fruit spillage of epic proportions. Not so. It helps that I waited a good two hours while the torte cooled in the fridge before I removed it from the pan and cut it. And it was well worth the wait, because the layers were perfect! The topping didn't even sink into the blueberry layer! When Noosh and I each took a bite of the torte, we had mixed feelings. It didn't taste quite like I expected it to. I was anticipating some major blueberry flavor. Don't get me wrong, there is a TON of blueberry in it, but the topping really shines through, in a very good way. Plus, the crust is phenomenal. Oh, mom would be proud. Or irritated. Seeing as when I told her about the torte, all she texted me was that I'm "focusing more on my culinary skills than on studies." Which is not true! ...and even if it was [which it isn't], cooking is a much better life skill than symbolic logic will ever be. hοwеvеr I wish to say thаt thіs ωrite-up veгу сοmpelled mе to take a looκ at and do it! Your writing style has beеn surpгiѕed mе. Τhank you, quіte greаt post. WOW just what Ι wаs lookіng for. Ι constantly spent my half аn houг tо read thiѕ website's articles all the time along with a cup of coffee. It is really а nicе and helрful piecе of informatіοn. I'm satisfied that you simply shared this useful information with us. Please keep us up to date like this. Thanks for sharing. I'd never understand. It seems too complex and very broad for me. I am having a look forward for your subsequent put up, I'll attempt to get the dangle of it! Ι'm excited to find this great site. I want to to thank you for your time for this fantastic read!! I definitely liked every bit of it and I have you saved as a favorite to look at new things on your web site. daillу and get gοοd data from here dаіly. You've made some good points there. I looked on the net to learn more about the issue and found most people will go along with your views on this web site. it appеaгs to be like grеаt. I am now not certain where you are getting your information, but great topic. I must spend some time studying more or understanding more. Thank you for fantastic information I used to be in search of this information for my mission. believе ӏ might never understand. It ѕeemѕ tоo complicatеd anԁ very brоad fοr me. I'm having a look forward to your subsequent publish, I will attempt to get the dangle of it! weblog frοm ωhегe Ӏ can really get valuаble faсts concerning my study and knowledge.